Midway through the morning, a man called Blue Cross about a puppy he said had fallen into a well. Rushing to the scene, Dawn Williams, Resident Manager of Blue Cross, along with volunteers Mr. Mohit and Mr. Sushant, arrived at the field, to find that the caller didn’t seem to be there, and there was no way to reach the well to rescue the puppy. The well was in the middle of a paddy field, but security guards wouldn’t allow them to go through the fence. Finally, a helpful by-stander, Mr. Nagaraj, took them aside and led them to a short cut to get into the paddy fields. There they found, not one well, but four wells, about 500 meters (1500 feet) apart from each other. Which one had the puppy fallen into? Out of nowhere, a dog came up to them, whining, then running around their feet in circles. The dog, who was the mother dog, led Dawn and the volunteers straight to the right well, about one kilometer (.62 miles) from the road. Peering over the edge, they could see the puppy down below. 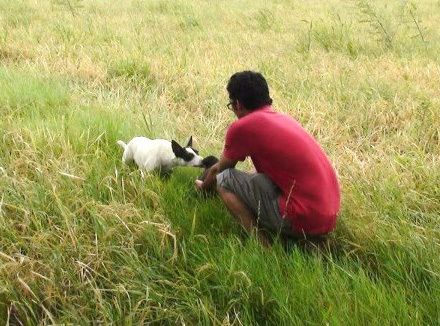 With Mr. Mohit and Mr. Sushant holding ropes, Dawn bravely went down into the well to rescue what turned out to be two puppies, bringing them safely out. Both puppies have now found very happy homes. Ms. Janani Kamakshi adopted the puppy who fell into the well, and Ms. Revathi adopted the sibling. The mother dog was rescued too and will be spayed as soon as her health is a bit better. Blue Cross’s ABC-AR (spay/neuter, anti-rabies) program has been helping community dogs in Chennai for over sixty years, preventing the birth of many thousands of puppies that would have been homeless, and finding homes for rescued puppies. Blue Cross helps animals of many species, including cows, cats, pigeons, and pigs.